This is Mystery 32 re-issued. There are lots of excellent comments on that one that answer almost all questions except what is the train? That should complete the What? Where? When? As a hint - Incidentally, on the end of the leading carriage, just above the headstock is a typical LNWR board showing the destinations the carriage is allotted to serve. The whole board cannot be seen, but the following can be made out: ‘Crewe, Carlisle, Liverpool’. The first four carriages are one of ten Liverpool, Crewe and Carlisle sets as running c.1919-2 These were were fairly typical four-coach Inter-Corridor sets, consisting of two 9ft 0in wide high-roof corridor brake ends flanking two 8ft 0in wide arc-roof corridor coaches. This was done because the arc-roof stock was originally gas lit, but has been converted to electricity but without dynamos and cells. The lighting was supplied by the adjacent high-roof vehicles. The set names were slightly misleading, as in fact none was scheduled to work to Liverpool. The sets were mostly employed between Crewe, Preston, Carnforth and Carlisle, with odd trips to Barrow, Windermere, Northwich and Euston. I am going to guess that the train is the 9.40am from Euston to Carlisle (No.14 circuit). I put this picture many years ago in �LNWR Miscellany Volume Two�, simply because I liked it and thought it was interesting. I had no idea of the location but was told it was �near Garswood� by one of the then LNWR experts who was always willing to share his knowledge and I thought he must be right. Recently, however, when I was handed two nice prints of it by John Ryan and passed them on to Norman Lee, I was later told by Norman that it could not be �near Garswood�, on the line from Lime Street to Wigan, as the 1909 OS map shows the line to be quadrupled all the way from Carr Mill to the main line south of Wigan, and though the St Helens � Carr Mill section is double there is no straight stretch in a cutting which matches the picture. So it is particularly pleasing to have all the contributions to Mystery 32, which identify the location beyond doubt as between Winwick Junction and Goborne Junction, and many thanks indeed to those who confirmed the location, and especially to Ian Fisher for taking the trouble to go there in person to check it on the ground. So the question now is: what is the train? Philip guesses the 9.40am Euston � Carlisle and he may well be right. But the various replies to Mystery 32 agree that the picture was taken in the morning in 1913-14 and that there are L&Y carriages at the rear. I have to hand only the OPC reprint of the October 3rd 1921 Timetable, and on that basis suggest Philip�s guess of the 9.30am from Euston is too late in the day, as it was due at Warrington at 2.29pm. So I would guess myself that the train is the 9.15am from Crewe, which left Warrington at 10.2am and had through carriages to Blackpool (Talbot Road), Edinburgh, Glasgow and Perth. I am unable to agree that that the photo was taken in 1913-4. The clearly marked Inter-Corridor set depicted was only formed in 1919. These sets did not exist in 1913 or 1915. If the three coaches at the rear are LYR where did they join the train? I don�t associate the LYR with either Crewe or Warrington. But there is indeed nothing in my carriage working schedule to suggest an LYR portion on the 9.40 am from Euston. Through carriages to points North of the border would have been WCJS stock � which this train is not. Apart from this train I can find no other Liverpool, Crewe and Carlisle set which would be found passing Golborne on the down line between 0900 and 1800. Did H.Tidey take any other pictures at this place? If not, why not, after lugging his cumbersome photographic equipment to this not very accessible location? This is Tidey T249. Tidey pictures T232 to T259 all seem to have been taken on the same trip and cover the Lancashire area, Euxton/Farington and Ainsdale, this one, and another described as near Golborne. There is also a Loco Pub card almost certainly his, taken at the same location as the near Golborne view. There are some gaps in the series where the Loco Pub card could fit in. Several of the pictures were advertised for sale in Railway and Travel Monthly in 1914 and one was published that April, putting the photo dates as almost certainly 1913. I am not at all sure how this will tie in with the carriage workings? Our photographer, may also have taken, Mystery Photo 36, on the same visit, being within an acceptable walking distance, between both locations. Carrying those glass plates would make you quite fit. Getting to the location of Photo 210, would involve a walk from the end of the platform, at Newton-le-Willows, along through the Goods Yard, and then to the spot at the over bridge of the L&M across the 1864 cut off. Difficult to take photos after midday here - sun right down the barrel, also now difficult to get to ! "The first four carriages are one of ten Liverpool, Crewe and Carlisle sets as running c.1919-2" - is that a correct assumption? You are not suggesting, surely, that there were no such services before 1919. So what sets worked (or might have worked) on the services between Crewe, Carlisle and Liverpool in 1913-14? Did any of them comprise high-roof brakes + arc roof intermediates? I can't see that anyone has yet contributed that information. Would that not help to shed some light on the mystery? I think (off the top of my head) that a Marshalling Circ for 1913 exists - at the very least there is the reprint of the 1910 issue, and I have some for 1911 (bound with NN&P notices). And I think Philip also has the ND Local Coach Working for 10.1913 (or is it 10.1914?). If it is indeed a Down train between Winwick and Golborne (as seems to have been established), then where would the L&Y vehicles have been attached to the train? I would have thought that L&Y vehicles on a LNWR train was a much more common sight north of Wigan/Preston - but I could be wrong. Is there any evidence in the documents of 1913/14 for L&Y vehicles on LNWR trains on the main line south of Wigan? Did any L&Y vehicles work (eg) Crewe to Blackpool? One possibility is that the train is empty stock, which might explain the LYR coaches. But as I have said, the Liverpool, Crewe and Carlisle sets were only formed in 1919. Many thanks, John, for this confirmation of the date as being 1913 or 1914. This date is supported by the condition of the engine, which is �as built�: pyrometer fitted (small pipe emerging from top of smokebox); no sand box on the front of the driving splasher; cylinder fixing bolts of the original number; and type of tender. Clearly, therefore, Philip�s identification of the four leading carriages as �one of ten Inter-District sets formed only in 1919� is in error. He is right of course that one would expect a train destined for Scotland to consist of WCJS stock � this occurred to me after sending my guess as to the train. The 3rd October 1921 timetable reprint shows two other possible candidates for the train: the 11.9am from Crewe � �Through Carriages London to Windermere, also Birmingham to Blackpool (Central)�, which left Warrington at 11.45am; and the 2pm from Crewe � �Through Carriages London to Blackpool (Talbot Road), Windermere and Whitehaven. Luncheon Car � London to Crewe�, which left Warrington at 2.34pm. Rather than �guess� one of these it might be wiser to look for a 1913 timetable. As regards more photos taken by Tidey on his 1913 trip, I have Tidey No. 4783, presumably two exposures previous to Mystery 210, which shows another �George� in �as built� condition with a much more substantial train, which I would guess � if forced to do so! � is the down 2pm �Corridor� somewhere in the same area, but so far as I can tell, could be any other �Scotch� express, up or down! My copy of the Carriage Working booklet dated October 1913 shows three Crewe and Carlisle sets made up of four gas lit coaches. They were 3=4, that is two six-wheelers and a 42-footer. Their seating capacity is shown as 130F and 10T, which I think is probably a mistake! Their workings are not specified. They had disappeared by 1915, and the booklet for that year shows just one Liverpool and Carlisle set made up of 5 x 32ft 0in six-wheelers seating 18F and 110T. The Liverpool, Crewe and Carlisle branded sets appear only in the 1919 booklet. So it is all a big mystery. �.....which I would guess � if forced to do so! � is the down 2pm �Corridor� somewhere in the same area.� Hardly. 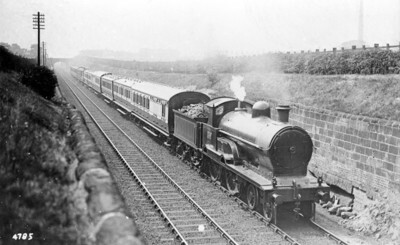 That train was scheduled to pass WInwick Junction at 5.16pm (in 1923). And of course was formed of very distinctive rolling stock. 3. Do not assume that the train service of 1921 was the same as that of 1913/14. Following the wartime reductions, the service was restored to peacetime levels in 1919-22, but not necessarily in exactly the same format as pre-war. Note substantial retaining walls on both sides of the tracks. Some repairs are needed at the foot of the wall beyond the locomotive. Straight race track to the North of Winwick Junction?